#31762 Can I re-download e-Sword X? BTW, your Mac should have a recovery partition on it have you tried a recovery boot? #31761 Can I re-download e-Sword X? you will/would have purchased eSword-X through the Apple store. Once you have reinstalled MacOS just log into the App store with your Apple ID and you can re-download the app. I ran into an issue I would like to make users of the Mac version of eSword aware of. I had an issue with an update from Apple that caused my machine to no longer move past the login after entering the password (I had gotten the Spinning BeachBall of Death). Well, it appeared that the restore functioned properly, but when I tried running eSword-X only the default library items were there. All of my premium resources as well as the other installed items were .... gone. Ok, i found this previous post (which gave me tyhe files location) and was able to search my back up. What I discovered was that the "Application Support" folder was missing from the backup. It was not being backed up. After further digging I found that that specific folder was in the "Exclude from Backup" list. I also discovered that the only way I could remove that folder from the exclude list was from the command line. This has to be done from a terminal window and you have to enter an administrators password to use the utility. sudo tmutil removeexclusion "/Users/YourHomeDirectory/Library/Containers/net.e-sword.e-Sword-X/Data/Library/Application Support"
After running the above, I had TimeMachine do a backup and now the directory and related files are being backed up. Moral of the story? Don't assume that your backup is working. Check it out by testing it. 2) If you are using Time Machine, check to be sure this folder has not been excluded from the back up process. will find all excluded files/paths for Time Machine. sudo tmutil isexcluded "/Users/YourHomeDirectory/Library/Containers/net.e-sword.e-Sword-X/Data/Library/Application Support"
will check to see if that specific path is excluded. This is something like what you would see running the above command. Roys-Mac-Pro:~ roycottingham$ sudo tmutil isexcluded "/Users/roycottingham/Library/Containers/net.e-sword.e-Sword-X/Data/Library/Application Support"
The GREEN text is what you are looking for. [Included] is good, it will be backed up. [Excluded] is bad... it will not be backed up! I hope this information will help prevent someone from having the same issues I experienced. Note: I have also copied my resource files from this folder to a safe place where I KNOW the Time Machine is backing them up! If for some reason the backup process reverts to skipping that folder, and I need to, I can copy the files over. Playing in Terminal and using the sudo command can be VERY dangerous to your system. Don't do it if you are not sure of what you are doing. You can render your system un-bootable and loose data with a wrong command or a slip of the fingers. But for some things that is the only way to fix issues. I have ran into an issue where the new version of e-Sword appears to break the file convertor. This error occurs with both Windows 7 Ultimate & Windows 10 (both running in vm's). If I downgrade (reinstall) to e-Sword 11.06 the error goes away. Keep your install file for 11.06 (or whatever version you are currently running) incase you need to backtrack until Rick can resolve the issue. or here ... yes this is a commercial site. Since it is not available on e-Sword I'll post the link. They do offer a free basic app but the lions share of their stuff are resources that are still under copyright hence the cost. You are indeed most welcome. I did take a quick look and the resources appeared to be correctly formatted. If you have any issues and I will see if I can get the time to fix them. I thought I had responded already but I do not see my post. Here is a page on Apples site about retrieving backups. Depending on how you have things set up you "may" be able to retrieve a backup from the cloud. (Apple tends to do this kind of thing automatically for users). I have recently started using a Mac again (I used to have a PowerMac and now have an older MacPro) and really liked eSword HD on my iPad so I am playing with the Mac version of eSword X.
I do windows two ways from my Mac. 1) I remote into my Windows machine using TeamViewer. 2) I run Windows in a VM using Parallels. From trying to use another one of my Bible programs on the Mac by employing WINE/CrossOver I would suggest avoiding that route. I would recommend Parallels and a VM (Virtual Machine) for running the occasional Windows App. e-Sword actually works well this way. Anyhow.... I had the Windows resource here and downloaded the new version of the convertor for my windows machine. I converted each of the resources found in the Lewis Sperry Chafer Collection for you. I have attached a ZIP file of the resources here. If Josh wishes to do so he can add it to the download area for the collection. Also note... 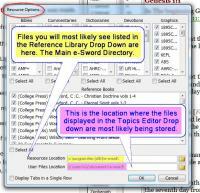 If you are having issues finding the Topic file you might (depending on how you are trying to open the file) be having e-Sword look in the wrong location for the file. you are adding a topic inside the currently open topic file (kind of like adding a new chapter). you are NOT at that point creating a new Topx file. As he himself stated, Journey's information was correct. In fact that is how the Help file (instruction manual) has you doing it. Also attached here are screen shots (for one of the other posters who requested them) showing journey's method. Please note that this is running Win 7. The Optional way of accessing the Topic files from the topic Editor. Finally reading the instructions and playing with the software is how you "Get use to the software". It really is the only way to "learn" (get use to) how the programmer chose to do things. and YES they will pop up like a conventional Strong's number *AS LONG AS* you have an entry for them in the dictionary you have e-Sword set up to look at for Strong's numbers. One of the missing posts that Josh mentioned must have been one that B.H. had made. In it he suggested using ToolTipNT to remove the links. That fantastic tool can strip out the hyperlinks. 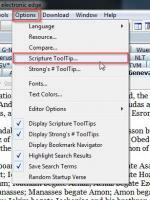 Just copy the text from the e-Sword editor and paste it into ToolTip-NT. Use the [Delete] Button in the Hyperlinks section. Viola! Gone! Then copy and paste back to e-Sword. Use the newest version of ToolTip-NT. Usually, scriptures fail to pop up because the bible version you have selected does not contain them. example - I am hovering over an OT link but the bible I have selected is NT only. the default tool-tip translation I have set e-Sword up to use fits the same bill. I chose a translation that does not cover the verses that the tool-tip points to. If none of this applies to you, can you give a few examples? I'll gladly check in mine to see if the links work.